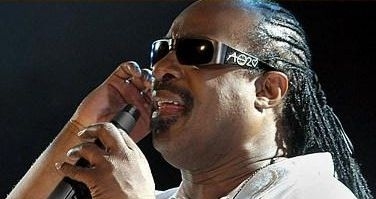 Born on May 13, 1950, blind person of birth and third of a family of 6 sons, was born Steveland Morris, son of a Protestant shepherd and of a mother combatant, person whose blindness forced him to change his way of communicating with the world, replacing the forms for notes, the light for the melodies and the outlines for rhythms, creating a musical full world of tones. His parents, when little Stevie was 5 years old, separated and moved with his mother and 5 brothers to Detroit, where they survive not without great efforts. His voice - out of the ordinary- causes his mother to enter the choir of the church; Is his first contact with the music. But his soul full of rhythm and swing did that it was not late in meeting others "black child" of the parish, continuing the steps of "The Miracles" and other groups of Rythm and Blues or Jazz, devoting itself to do small shows in the streets of the quarter. There were 5 devilish creatures moving with a few frantic rhythms and interpreting a pagan music. This did that a feligresa was denouncing such an "aberration" and interrupted momentarily the musical beginning of Stevie, who had to be content to hear music in his favorite program of radio, sundown and to dream with have a piano. 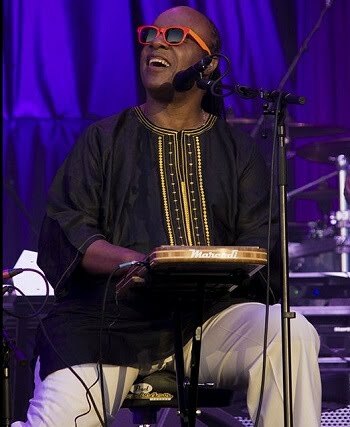 The luck, in this case smiled him at the child Stevie, and did that a charity organization it was giving him a drums, which although it was not the dreamed piano, served him to start creating rhythms. It begins to touch with more frequency and takes part in a group with a cousin of his, the one who provides to him an audition for the record company Tamla-Motown, where it is immediately hired on having remained bewildered with this child of 11 years old. 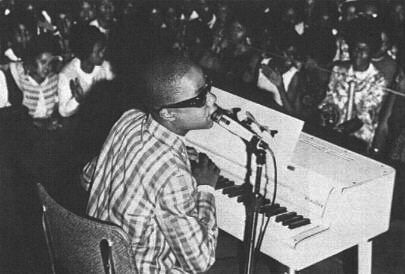 The incipient label Motown, created by blacks to produce black music in a white-hostile way, re-baptizes him as Little Stevie Wonder. 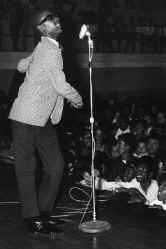 The Motown throws him and will not be late in reaching his first success, "Fingertips", one dance song recorded in direct that makes him obtain his first disc of gold and to turn him into one small star. At this age, 13 years, Stevie is already a musician and perfect composer and he starts hobnobbing with the big ones as Marvin Gaye. 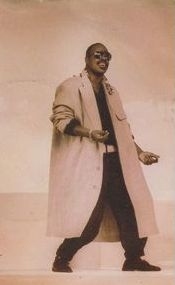 The years go and decides deleted the "little" from his stage name, and start recording a series of albums produced by Clarence Paul. His voice was changing to him. He grew a mustache and hoped that the concerts will throw the girls phone numbers. His mother worried that the music does not neglect his studies and hired a private tutor to travel with him at that time he had to make some tour. His name was Ted Hull, a graduate of Michigan State University. Together Clarence Paul and Ardena Johnson, an employee of the Motown, they assumed the role of tutor. The successes at this time did not give back, and despite the work that had trouble eliminating the tagline of "little Stevie" emerged great songs as "Uptight", "I Was Made To Love Her", "For once in my life", "My cherie amour", "Shoo-be- doo-be-doo-da-day", or "Yester-me, yester-you, yester-day". All of them reached the top ten, and helped make Stevie one of the most successful artists. Stevie's compositions which demonstrate a talent and innate qualities of the great composer that exploded in a brutal manner in the next decade, breaking all molds known so far. 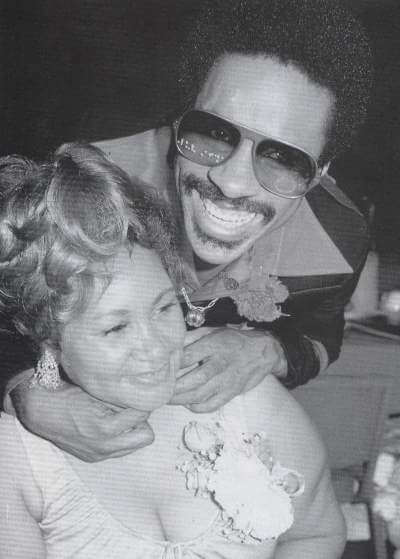 This is the most glorious epoch of Stevie, it came out definitively the addition of "Little Stevie" from the moment in which he married Syreeta Wright, which was employed at the distribution department of the Motown, collaborator at compositions of first Stevie's albums of the seventies, his marriage did not last very much, but they kept on being very good friends up to his death in 2006. After getting divorced of Syreeta, one married again another member of the Motown, Yolanda Simmons, with which it has two sons, Aisha Zakiya and Keita Sawandi. 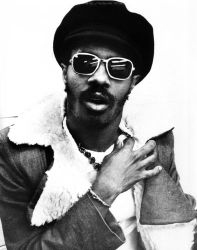 Stevie took contact and position(attitude) of the social and political situation of the country, interfering face to face in the conflicts of his generation. Stevie met Johanan Vigoda, lawyer, who faced him in the worldly world of the music and the business, his symbiosis with him, they did that Stevie was obtaining a millionaire contract and a creative unimaginable freedom in those moments in a company a company as strong and strict as Motown, Stevie said to him: "You do the best thing that you could with the business and with the money, I do the best thing that could to give the best product, like that any thing for that you ask will not be"unreaso le". The result was a contract for 7 years and thirteen million dollars. In the summer of 73, the vehicle suffered an accident in the one that was traveling with a truck, remaining in comma and there were moments in which he was afraid for his life, it is said that during the period in comma only he was answering moving his fingers when his manager was singing to him to the ear the lyrics of "Higher Ground". After a time he woke up, but it lost the sense of the smell, being provided(relying on) this way with only three of the five for the rest of his life, all this caused to him deep trace and changed to him the way of perceiving the reality that him makes a detour and of course his music. 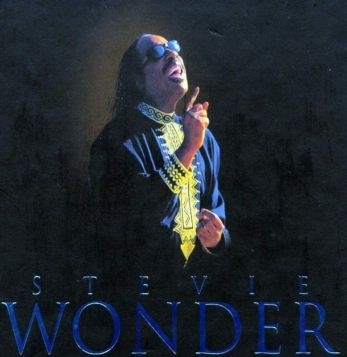 From 1974 to 1977 Stevie Wonder gained 14 Grammys including three "Albums of the year" continued by Innervisions, Fullfillingness firstfinale and Songs in the Key of Life, for many people one of the best albums of the music. It was a period very rich in creativity and awards for Stevie, precursor in the employment of synthesizers and source of inspiration for the future musicians and and contemporaries. He had a parentheses in the year 78, which was been grateful in the collection of the Grammy to the best Album of the year by the winner of this year; "thank you Stevie for not extracting album and allow me this year to receive it. ". The songs of this epoch were full of experiences transcendental and next to the Gospel song, other floods of vitality, declarations of beginning and shape of a reality and confictos social. The decade finishes with a soundtrack for the documentary "The secret life of the plants", which in spite of not having the commercial success of the previous album, granted to him the platinum disc, although the movie did not appear to the public in general. 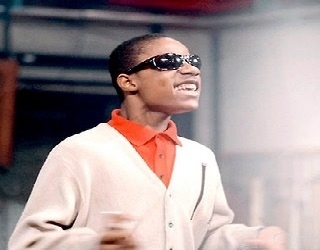 The decade begins with a new work of Stevie Wonder, Hotter Than July, it receives the 80 to rhythm of reggae thanks to his new hit, "Master blaster" and is opened for a wider hearing. Struggle to get the day of the birth of the Nobel Peace Prize, Martin Luthero King, was considered to be a holiday in the EEUU. He does important collaborations as "Ebony and Evory" with Paul McCartney, "Just Good Friends" with Michael Jackson, along with Dionne Warwick, Elton John and Gladys Knight in "That's What Friends Are For" with that he obtains a Grammy, or his collaboration in the proyect Usa for Africa in one of the world's most successful songs, "We Are The World". A Greatest hits double album with the name of Musiquarium, shows us a fine selection oh hits and essentials, plus four unrealesed tracks with a high level. In 1984 throws "The woman in Red", for the soundtrack of the same name, obtaining a notable success. His hit I Just Call To Say I Love You" wins the Oscar for the Best Original Song, and in Spain one of his songs, Don't drive drunk, was part of a successful campaign for General direction of Traffic, so that people would not get to drive a car if are drunked. In EEUU the song and the accompanying music video too was for which were used in the Ad Council and the US Department of Transportation's Drunk Driving Prevention public service announcement the following year. The decade continues with the album that was destined to be released and was a little on hold before the soundtrack previously mentioned, In Square Circle, with which again it was able to get into the the lists of hits. "Characters", album almost unnoticed but still with this extract and touch "Wonder" of good taste. 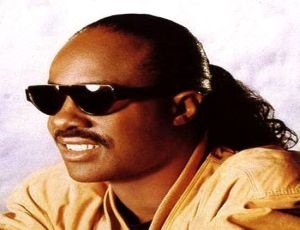 The decade comes to end, undoubtedly marked as the most commercial of Stevie Wonder, which although he fails to achieve the creativity of his incredible golden age of the 70's, if it reaches sales and maximum popularity, being included in the Rock and Roll Hall of Fame in 1989. This stage is the darkest of this genius, after the creative explosion of years 70 and use of the same one in the 80. This decade begins with another soundtrack, Jungle Fever, movie by Spike Lee, devotes himself to helps charitable, appearances in his radio station, calm life in his country adoptive Ghana and he receives awards as the Grammy to the whole life. Conversation Peace means a return four year later with two Grammy Awards, and a fantastic ballad song, "For Your Love", yet it did not get the commercial success with its previous albums. Any more collaborations with Pavarotti and Friends, 98 Degrees in "True to Your Heart" for the movie Mulan. He realized a world-wide tour, from which he left the double album in direct "Natural Wonder" with which it crossed the half world including Spain, and several compilations published for the Motown, Song Review, Ballad Collection and At The Close Of A Century. This decade begins with an awaited publication of a new album that does not come, 10 years it is necessary to wait, from Conversation Peace of 1995. Participation in charitable events, collaborations with other artists, but his awaited album can not see the light. Passes away of persons nearby and wanted by him as Syreeta Wright, ex-wife and collaborator in his 70's stage and good friend, his mother Lula Mae Hardaway, his brother Larry Hardaway, the death of Ray Charles, that of Gerald Levert, Luther Vandross, are certainly negative years for the good music. 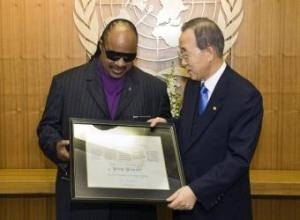 Stevie receives the notification from the Industry Association of America (RIAA) the certificate of 10 million sold units of the mythical double LP Songs in the Key of Life, be the chosen above mentioned album also to be a part of the The US Library of Congress where preserves the audio events that arec ulturally, historically or aesthetically important. 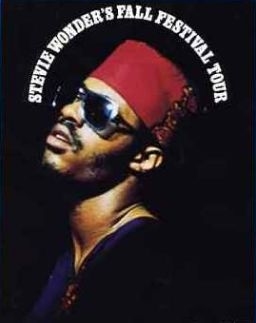 In the list of 2003 of the magazine "The Rolling Stone magazine" with 500 albums bigger of the whole history included four of Stevie Wonder, also in 2008 is considered by the magazine one of the ten best singers of all time. In 2004 there is included by the prodigious magazine in the position 15 of 100 best artists of Rock&Roll of all the times. The song "Love's in Need of Love Today", the already classic one of the Songs in the Key of Life is used, along with Take 6, for the tribute to the heroes of the offense of September 11, 2001 and sung to duo in 2007 with Bono de U2 for the documentary movie Darfur Now, on the terrible catastrophe of Darfur, Sudan. His highly desired album "A Time To Love", finally it goes out to the market in 2005, being again in the lists of successes and having a good success on the part of the criticism. Artists as: Alicia Keys, Avia, Mariah Carey, Tim Foreman (Switchfoot), Mary J. Blige, Kanye West, GeorgeMi chael, Jermaine Jackson, Michael Jackson, Nik Kershaw, Anthony Kiedis (Red Hot Chili Peppers), India.Arie, Musiq Soulchild, John Legend, Jay Kay, Donell Jones, members of Jodeci, Maroon 5, The Neptunes, Dru Hill, Babyface, Prince, Beyoncé Knowles or Aaliyah do not renounce to affirm the influence that Stevie Wonder has supposed for his particular works. The unexpected death of his mother Mama Lula in the year 2006, is the trigger for one one year after realizes his first tour in 10 years. It was something that his mother had wanted that it was doing, and that gave him forces to initiate a trip for the USA and Canada in the year 2008 and a continuation for Europe and Australia. Homage keeps on being employed at the project of a disc to his mother Lula, "The Gospel Inspired By Lula", a album that will not be a traditional gospel song, in it there will be able to be a song in Arab, in Hebrew, in Zulu, will include a wide bogey. In February 2009 he was the second person to receive the Gershwin Library of Congress Award for popular Song. He expressed his support at the time of Democratic President Barack Obama, and shared his life with fashion designer Kai Milla, with whom he has two other children. Being 7, the last born in 2005, the same day of his birthday. He contributed to the song "All About The Love Again" for the CD / DVD "Change Is Now: Renewing America's Promise" in favor of President Obama. In March 2009 he released his first official DVD Live At Last, Of his performances last year in London, and finishes this 2009 being named Messenger of Peace by the United Nations in recognition of his humanitarian work over the years. This decade begins again with suffering for the disappearance of great friends and artists, Michael Jackson and Whitney Houston. In 2010 a new tour takes him through Europe and Japan, and is named in Paris Commandeur des Arts et des Lettres. During 2011 is inducted in the Apollo Theater Hall of Fame in New York, and is part of the opening ceremony of the Special Olympics World Summer Games in Greece. The year 2012 receives two major new awards, the Billboard Icon and BET honor. If his participating in the Rock In Rio 2011 was considered the best in the event, 2012 in Lisbon gets to the delight of the audience. 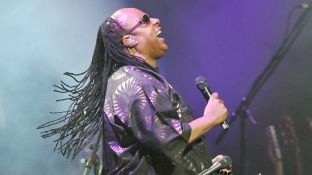 Rumors point to the publication -in the past year 2014 or early 2015- of new works by Stevie Wonder. One collaborating with the composer, producer, and winner of numerous Grammy, David Foster entitled When the World Began, another to be titled Ten Billion Hearts, The project "Through The Eyes Of Wonder", where he will give life to songs inspired by his unique perception, and where he will express with his music the world around us for a blind person, also remaining pending the gospel project dedicated to his deceased mother Gospel Inspired By Lula. Many projects that surely one of them will be realized in the near future. The lovers of the music we know that Stevie Wonder will always be a reference so looking at the past, living in the present, as dreaming of the future.